Restoration Completed June 17, 2015. Work began on The Papal Flag of the Palatine Honor Guard in early March. Professor Paolucci is very excited about this amazing upcoming project; the flag is not just a beautiful object of Vatican art, it is a piece of Papal and Roman history. This exquisite 17th century work was made to honor this military unit of the Vatican, formed in 1850 by Pope Pius IX, who ordered that the two-militia units of the Papal States be amalgamated. 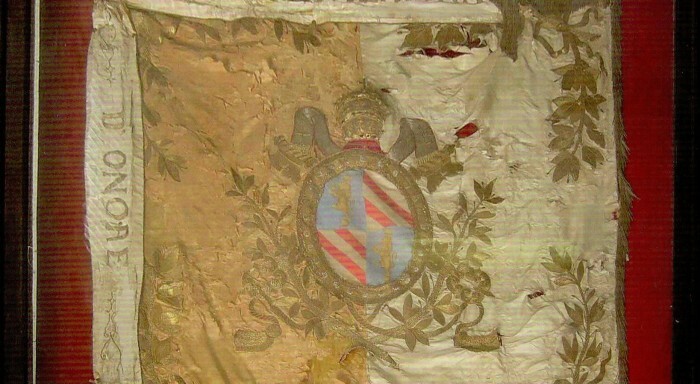 During the restoration process, the flag’s entire gold embroidery and the coat of arms of Pope Pius IX will be detached and placed on a brand new silk support—retaining the original handiwork yet restoring its former glory. The original silk fabric will be analyzed and treasured as an historical part of the Vatican Palatine Guard Tradition. The restoration is to be completed over the course of three years.